Andy Deans is searching high and low for a 130-year-old insect. He knows it's around here somewhere—but among the nearly 2 million insect specimens in the collection room of Penn State's Frost Entomological Museum—the museum's oldest specimen could be anywhere. Aisles of mismatched wood shelves and metal cabinets fill the fluorescent-lit room from wall to wall and floor to ceiling. 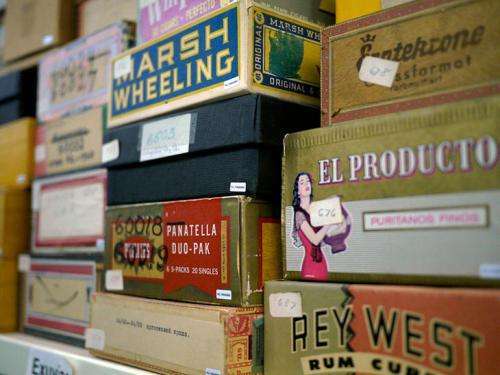 Countless bugs—dragonflies, lice, aphids, moths, butterflies and bees—are hidden in drawers, slide boxes and even vintage cigar boxes. As the museum's new director, Deans has charged himself with the task of reinvigorating the museum's public exhibitions and organizing the storage room to create more space for the University's active and growing insect collection. On this day, he's focused on the darkling beetle, a bullet-shaped beetle captured in Bethlehem, Pa., that got moved recently as part of the museum's revamp. "I have to dig it out from this cabinet," said Deans, who is also an associate professor of entomology. "It's from 1879, but looks like a recently pinned insect, except that the label has browned and faded." A 130-year-old beetle is not surprising for a collection of this size—insects preserved in a cool, dry environment can last for centuries. 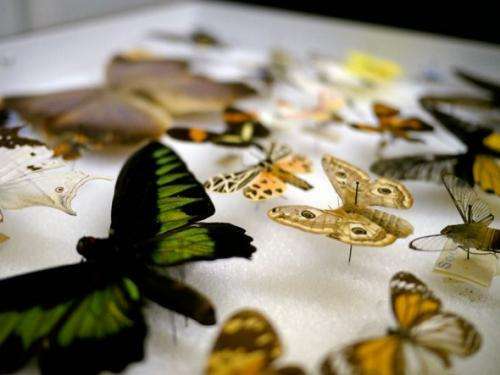 Though one of the biggest threats to these collections are actually other insects. Carpet beetles are famous for eating entire collections and leaving nothing but dust in their paths. But, carpet beetle threats aside, Deans is on a mission to better preserve the University's specimens and share them more broadly as well. To help increase the visibility of the museum's rare insect collections (including one of the top five aphid collections in North America) Deans is using ScholarSphere, an online repository tool developed at Penn State, to preserve digitized versions of the museum's analog field notes, manuscripts, species descriptions, glass slides and more. Making this scientific material available in ScholarSphere will help Deans to more openly share the University's rare collections with scientists at Penn State and other institutions. Released last year, ScholarSphere was developed to help researchers comply with federal data sharing mandates and to support the long-term preservation of academic and research data at Penn State. The repository service enables University students, faculty and staff to curate, actively manage and share their materials—if they so choose—with the University community and the world. "My goal is to bring Penn State into the larger fold of the academic insect community," said Deans. "There's a big network out there of scientists who exchange specimens and collaborate on collections. ScholarSphere will help showcase the talented researchers and unique materials that Penn State has to offer." 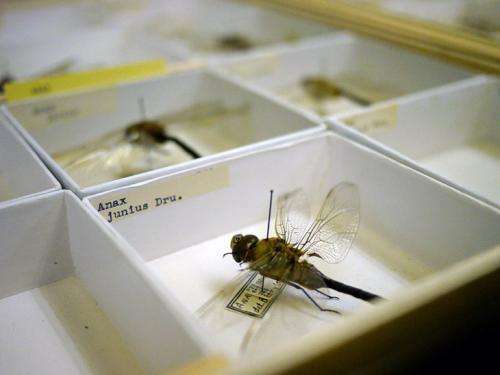 One extremely rare collection of Mexican dragonflies and damselflies—collected by George and Alice Beatty, a husband and wife team who made six expeditions to Mexico in the 1950s and '60s to study and gather the winged creatures—is the first group of entomological material to make its way into ScholarSphere. Though the 64,000 specimens, representing at least 800 species, in the Beatty collection have lost their vibrant blue and green hues after decades in storage, the handwritten field notes and manuscripts that Deans is scanning and uploading into ScholarSphere are still a valuable and unique part of the museum's portfolio. For Deans, the digitization process starts with a 50-year-old manila folder. It's filled with typewritten pages, a few hand drawings and a stack of field notes. Deans or a lab assistant begins by scanning each piece of paper (one sheet a time) and using optical character recognition (OCR) software to make the digital files word searchable. He posts the file in ScholarSphere and links to it from the lab's blog to get the word out. After Deans is finished with the manuscripts, he'll be able to move on to the dragonflies themselves. Tucked away in clear cellophane envelopes, the dragonflies will find new life with a quick scan (or a photograph), another round of OCR and a final upload into ScholarSphere. The only hurdle: this process has to be completed 64,000 times in order to digitize the entire collection. For the minimally staffed laboratory and museum (in the midst of renovations and infrastructure enhancements) the effort is an undertaking that could take years to complete. Though it's worth it for Deans, who believes publically funded scientific material should be openly available to American taxpayers and people around the world. Much of his research is funded by federal agencies like the National Science Foundation. Once publically available in ScholarSphere, the insect material will be able to help people all over the world who are studying entomology, biology, evolution and more. The dragonflies and damselflies will tell a story about the Mexican landscape and biodiversity during the 1960s that today can help scientists better understand regional climate and geographic change over time. 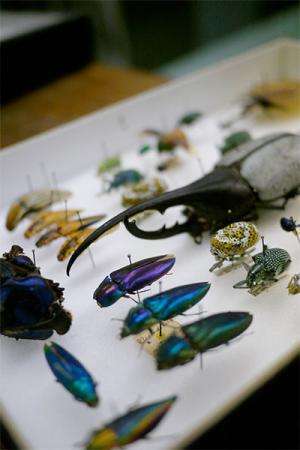 "It's not the size of Penn State's insect collection that makes it unique, it's the one-of-a-kind components," said Deans. "If we can raise awareness through ScholarSphere that this amazing resource is here, I think scientists will be impressed and come to Penn State to use it. For now, he'll get back to the digitization marathon, one that won't end with the last of the dragonflies. For Deans, there's still a collection of 15,000 lice and 100,000 aphids waiting in the wings. Check out Deans' work in ScholarSphere at bit.ly/andydeans .